Now that we’ve all got our hands on Mojave, let’s take a quick look at some nice little tricks new to this version of Mojave. Get a Start menu list of apps: Just right-click/Ctrl+click the Launchpad icon in the Dock and you’ll see a Windows Start-menu-like list of your apps. Create instant photos: Continuity Camera isn’t just limited to inserting pics into docs or notes. You can right-click/ctrl+click anywhere in a Finder window, or on the desktop, and select Import From Phone to instantly take a snapshot with your phone or iPad and save it as a file or PDF. It literally takes seconds. Bearing in mind you can also create “scans” of documents this way, this is a nice way of “scanning” your daily mail before destroying it for a truly paper-free office! Keep folders “on top” on the desktop: Look at the Advanced tab of Finder’s Preferences dialog box and you’ll see a new option to keep folders on top on just the desktop, leaving Finder windows with the traditional unsorted look. This will mean that folders will always be shown at the top right of the desktop, before any other icon or stack. Go dark in Safari: The whiteness of a webpage can be very bright if you’re using the new dark mode. You can fix this using the Dark Mode for Safari extension. It costs $1.99. No need for USB: As usual with the release of a new macOS, there are a million articles explaining how to turn macOS into a USB-stick installer. Who said blogging was just the same old recycled crap?! Well, there’s actually no need for a USB stick. Simply hold down Cmd+Option+R (or Cmd+Alt+R on some keyboards) when booting and before the Apple logo appears, to start an internet-based installation. Note that this will wipe your existing installation of macOS, and this will only work if you’re already running High Sierra on a modern Mac. Auto-time dark mode: This nice little app will let you switch to dark mode at night, and light mode during the daytime (or indeed, you can switch at any time). It’s free but the developer suggests a donation if you like the app. And why not?! 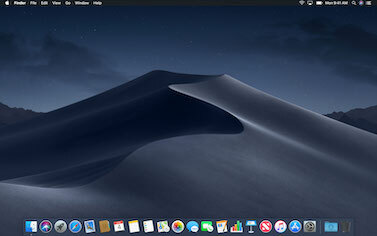 Get the old dark mode: Want the old dark mode, where only the menu and Dock went dark and everything else stayed light? Here you go. Turn off News notifications: By default the new News app will flash-up notifications about all headlines it thinks are interesting—everything from celebrity gossip, to trivial news stories. I doubt very much you will need or want this. You can turn off notifications in the usual way using the Notifications icon within the System Preferences app—just select News in the list of apps at the left and then click the None icon at the right. Search the News app: It’s not obvious how to search for new channels or specific news stories within the new News app. The solution is simple—just click either the date or the Apple News text in the top left of the window. A search field will slide into view. View trending apps: Want to view a list of apps that are trending in popularity within the new App Store? Just click in the Search field. A list will appear beneath. You got any more tips? Post them in the comments below.